The Islay Hill cow sculpture. If you hike up San Luis Obispo’s Islay Hill, at the top you’ll find a standing cow sculpture with binoculars pointing east. 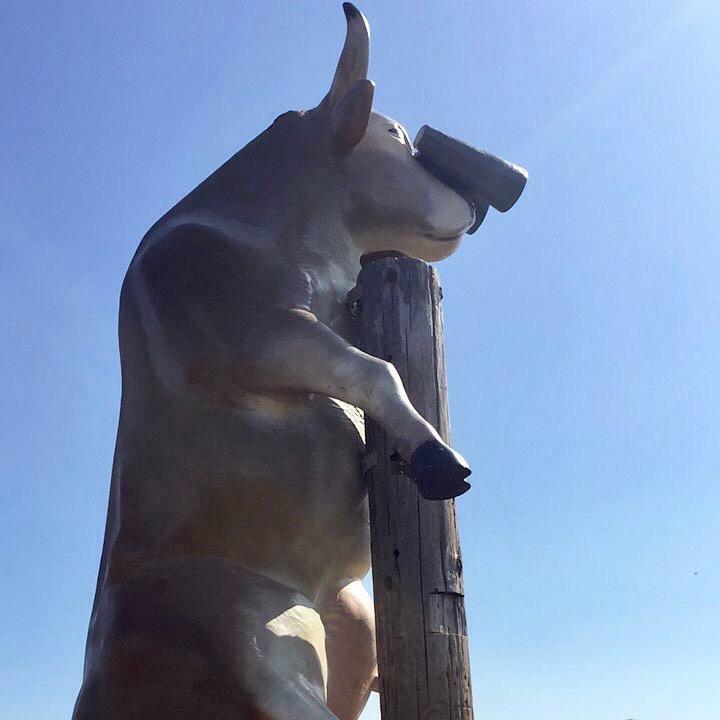 This fiberglass cow is called 'Moo With a View,' and it’s one of 101 similar artworks that appeared all over San Luis Obispo, as part of CodwParade SLO. That was the local version of a worldwide art display founded in Chicago in 1999. Since then, CowParade has expanded to about 80 international cities. Here in San Luis Obispo County, the cows were on display from September 2016 through May 2017. Then the top 10 cows were auctioned at a winery in Santa Margarita and the others were auctioned off silently online. The auctions raised a quarter of a million dollars and benefitted 40 local non-profits. The Land Conservancy of San Luis Obispo County was one of the top three auction recipients. Executive Director Kaila Dettman said much of that the money will be used to re-invent the space surrounding the Octagon Barn, a San Luis Obispo historical landmark. “Really, the sky is the limit and it’s a site that’s a lot of things for a lot of different people," Dettman said. She says the space will serve educational purposes. Through a planned museum and an old milking parlor, school kids will learn about the history of the dairy industry in San Luis Obispo. It will even be a place to create meaningful moments, Dettman adds. “We’re hoping people will celebrate family milestones there and really learn about agriculture in our county," Dettman said. To see the cows on permanent display, visit cowparadeslo.com for locations. Ears on Art goes to the Cow Parade Auction in Santa Margarita to mix with the artists and the cows. Artists will share their experiences of designing and painting a fiberglass cow. On the Central Coast, citizens, agriculturalists, and local policy makers have long recognized the importance of agriculture to their communities, and understand that land use choices and decisions impact not only the owners of the land but also the lives of neighbors and the community at large. A history of interest in managing development and growth and in preserving the physical and social amenities of open spaces and rural areas has long been a high priority to policy makers, public officials, and citizens in San Luis Obispo County.